Video games are a form of escapism, but they’re also your property. When you buy a game, you should be able to do whatever the hell you want with it. If you want to spend hours just punching women in Grand Theft Auto that’s totally your choice; it’s also a sign that you’re no fun at parties, but we’re not here to judge. But some video games are and, if you act like a sociopathic nutjob in them, they’re going to make you pay. 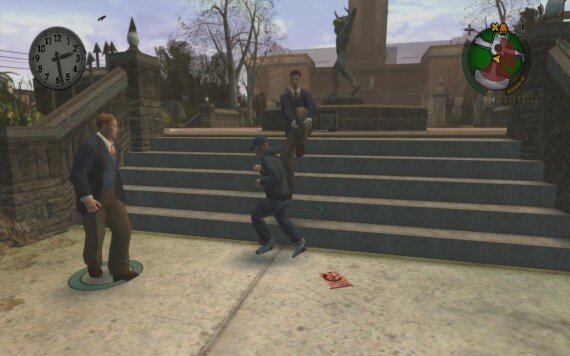 Bully is basically Grand Theft Auto set in a school. Instead of guns and gangs, you have punching and cliques. When you misbehave in the game (which is a nicer way of saying you drop-kicked a nerd in the nads), you’ll be hauled off to detention. For most games this would be a cleverly-hidden loading screen that played while you were dumped you into another part of the game, but not in Bully. In the game, if you’re unlucky enough to be caught you’ll be taken to detention and forced to do one of several menial tasks that cannot be skipped, at all. Sure it’s supposed to be a representation of crime and punishment in a school setting, teaching you to not be a bad person, but all it really teaches you is to never leave a witness. 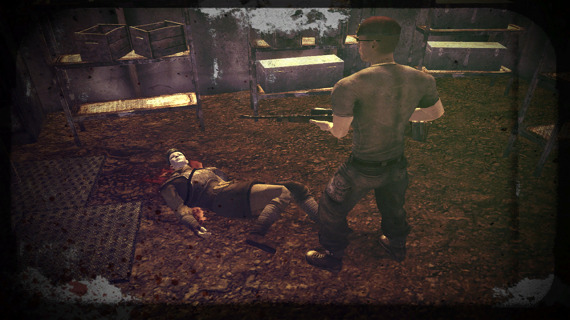 Fallout, like many open-ended RPG’s, can be played any way you choose. If you want to be a soldier, a stealthy thief or total paragon of virtual virtue, you can do so. But sometimes, choice is a bad thing, like in Fallout 2 which gave you the option to kill a child. As with real life though, killing a child bears a stigma. In Fallout you’re permanently renamed “child killer”. Now, this would fall higher on the list if the punishment was a little more harsh. Although if you decide that you grow weary of not having the FBI monitor your internet searches, and add a few more tiny notches to the handle of your switchblade, residents of the wasteland will attack you on sight. With Miniguns, since they don’t mess around when you’ve surpassed that two child limit. A timeless classic, which focuses on the protagonist Link and his journey to save a princess. Hey it’s not cliché if he invented it. Along the way, he’ll come across a veritable plethora of enemies and wildlife, like the imaginatively named “cuccos”, who are absolutely not chickens. The cucco serves almost no purpose within the game, except that it looks pretty and adds an extra dimension of life to the game. Also, if the player so chooses, he can smack it around with a sword. 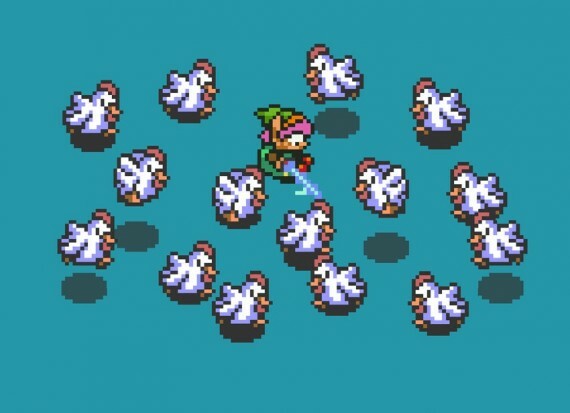 For attacking an innocent and beautiful creature, the game punishes you with an army of unkillable war cuccos, with the sole purpose of cutting Link’s pretty face. The indestructible hoard will harass Link until he leaves the area or dies, although the latter option is the only way to satisfy their blood lust. 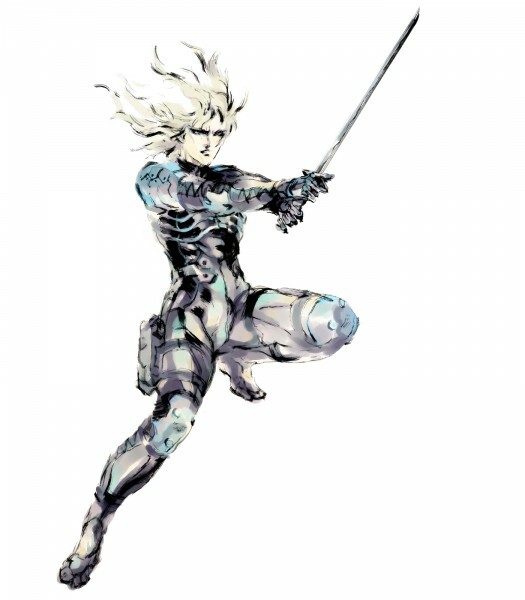 Although the game is arguably one of the finest created, many fans felt disappointed that they were stuck controlling the effeminate Raiden, when the brooding, fuzzy ball of gamer love commonly known as Solid Snake sat in the sidelines. It was understandable though; long hair and eye liner are standard for all special ops. Still, the character is likeable enough and the gameplay gives a player the option to do some pretty cool stuff and play in a way that suits their style of gaming. Strangely though, the developers anticipated that people in the early stages of becoming a serial killer would play and gave players the option to shoot seagulls. The game, in what is probably proof that developers really do anticipate everything, reacts to this by having Raiden’s in-game girlfriend call him and break up with him. She will then refuse to save the game for a length of time, presumably so both Raiden and the player can sit and think about what they’ve done. 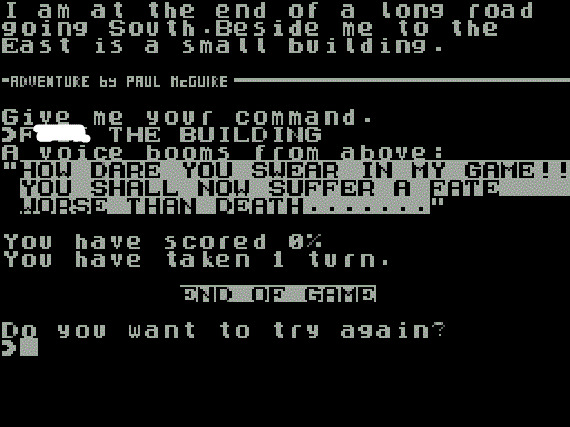 Text adventure games, for the uninitiated, were games with the most powerful graphic engine known to man: your own imagination. You’re given a story and you have to use your wits to answer questions and ultimately travel through the story. Like a blank bathroom wall though, some people just see this as way of seeing how creatively they can swear and get away with it. And in a vast majority of cases, you can’t. With some games ejecting you from play for doing so, playing a text adventure basically means you follow the same rules as 1950′s cinemas. 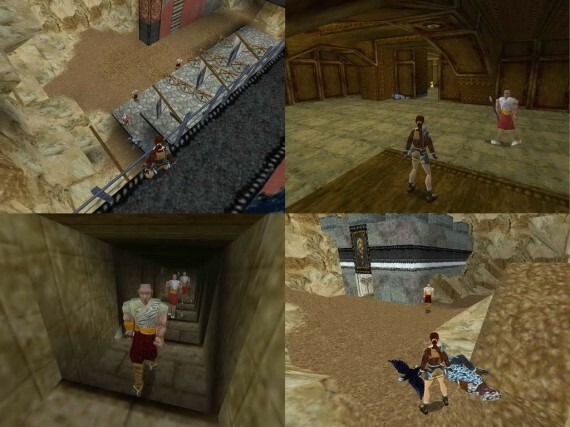 In this game, you enter the sacred Barkhang Monastery which is, unsurprisingly, filled to the brim with peaceful monks. Of course, if you attack them, accidental or otherwise, they will attack Lara in droves baying for her blood. Now this is standard videogame fodder, but just consider that the game is sending frail, unarmed men of peace at you, whom you are then forced to kill. It’s almost as if they know they’re going to get gunned down, and are only attacking you because they’re secretly hoping to be reincarnated as tigers, which Lara would then shoot in the face. The lesson here, as always: save your pent up rage for the British butler you pay to take it. Focusing on the adventures of Leon Kennedy on his adventure to save the President’s daughter, this game took the Resident Evil franchise into a new era, mainly one of shooting zombies with a sweet haircut. Leon pretty much does this all on his own, save for a single ally in the shape of Luis Sera. Now, you can only really interact with Luis once point in the game, and of course you’re free to take this opportunity to shoot Luis square in the face. 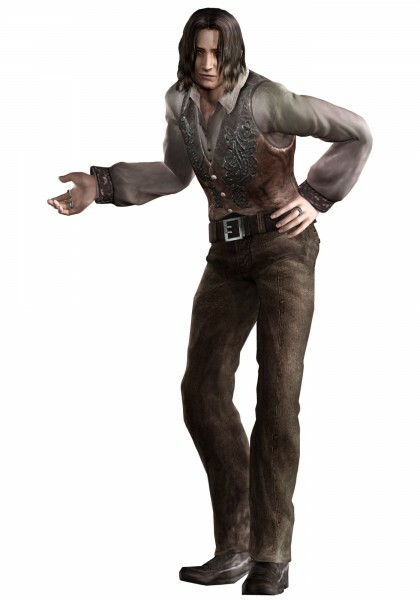 Being a nice guy he’ll shrug off exactly two bullets, before shooting you back in a specially made cutscene. If that wasn’t bad enough, a similar thing will happen if you try to shoot some fish in a certain body of water, meaning that even Mother Nature is trying to kill you. Mostly known as a cutesy RPG, Animal Crossing has a level of depth not often found in videogames, with the player able to invest months of their lives into a single game. However, amongst all of the nature and harmless fun, is one guy who really hates fun, Mr. Resetti. The character will spare no chance to lecture you on the importance of saving your game, but sometimes life gets in the way, or you just don’t want to. 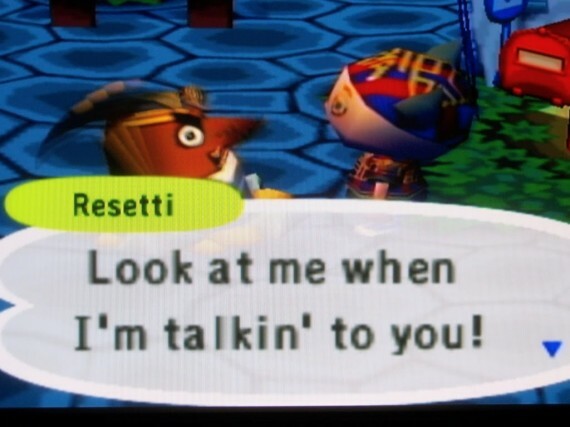 Well, if you do that in Animal Crossing, prepare for Mr. Resetti to lecture you about it. Do it enough and he’ll eventually force you to write him a letter of apology or even make you say, out loud, “I like you”. This is incredibly difficult to explain away if you’re in public, and the excuse “the game made me do it”, only makes people more likely to report you to the police. In fact, if you ignore him enough he’ll lie in wait, waiting for you to invest a good few hours into a game, then he’ll turn off your console. While you frantically wonder that’s happening he’ll pop back on screen to lecture you once again about why you should save and restore your game. 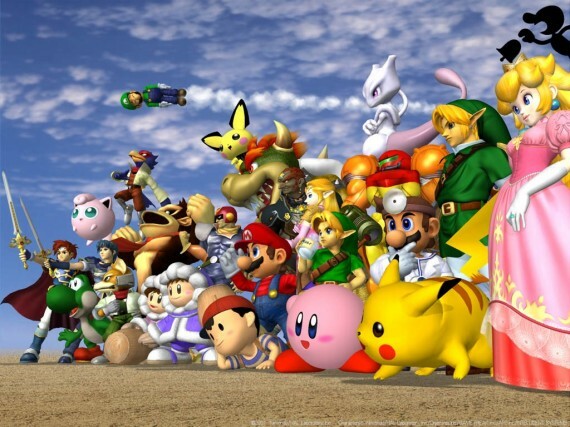 Super Smash Bros. is known in the gaming community for having punishing AI, which has over the years been studied by fans extensively. Some have even theorized that the game learns to adapt to your play style and counter it. Which is where things get odd. Play like a jerk by taunting or utilizing cheap moves and dirty tactics, and some say the computer will punish you for it. This would sound crazy if it wasn’t for things like this video, in which a player makes a rather amateur mistake, to which the computer responds by crouching over and over again (a well-known taunt in the video game community). If Mr. Resetti is the guy who threatens you, Grunty is the one who actually comes over to your house to break your legs. 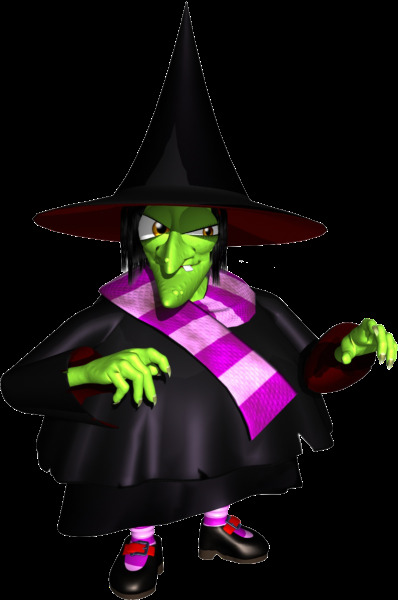 Grunty will warn you that if you cheat, she’ll delete your saved game. Now a similar threat is made earlier in the game if you choose to ignore the tutorial, a threat that is never carried out. So it’s natural to ignore Grunty as well, if only because her voice is annoying as hell. But no, if you ignore her warning and cheat Grunty can, and will, straight up delete your game. You know the game you paid for and should by all rights be able to do with as you please? Oh, gaming is such a cruel mistress.